I tried to go bold with all-over red but it was..overwhelming. Blue (well, more like turquoise?) was a little easier on the eyes. Plus, I'm so very comfortable in blue. It's my absolute favorite color. Sadly, I never got a picture when the room was actually finished. But it was darn cute, I tell you! Also, RA reminded me of this article from New York Magazine in 2008 about people who wear all one color all the time. I remember loving the idea at the time and wishing I could do blue like the first girl (who buys white Christian Louboutin shoes and colors them with electric blue sharpie. Which seems to me like some kind of fashion sacrilege). What color did you go with? Let's see it! I need to remember to keep NOT looking at your outfit before I wear/post mine. I always have outfit envy. Reallllly love this outfit. A Maxi for me tomorrow...just wait. and that room...are you kidding? 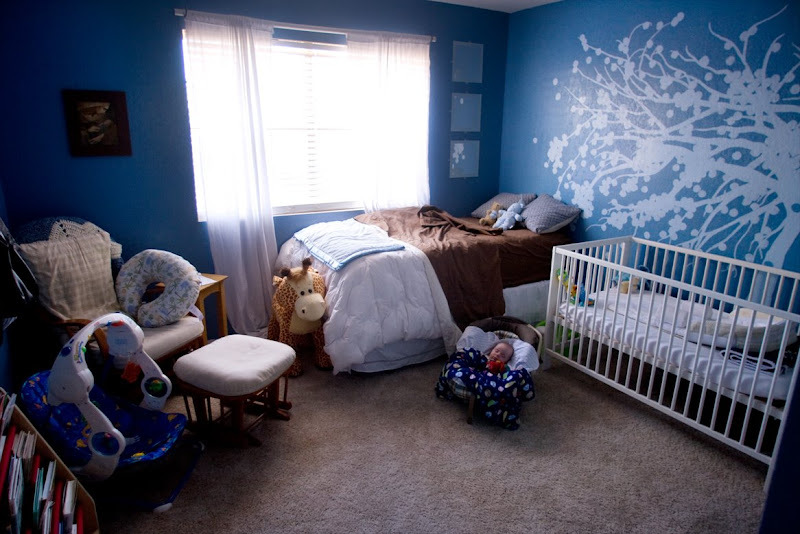 Good thing Julia and baby #2's room is already cinder block grey and semi put together..that room is amazing. Love the great finds you get by thrifting. Love blue. thanks for taking the time to orchestrate this challenge. i love it. i'm getting introduced to so many other blogs and bloggers. and it's a lot of fun! Neat article from NY Magazine - thanks for sharing! 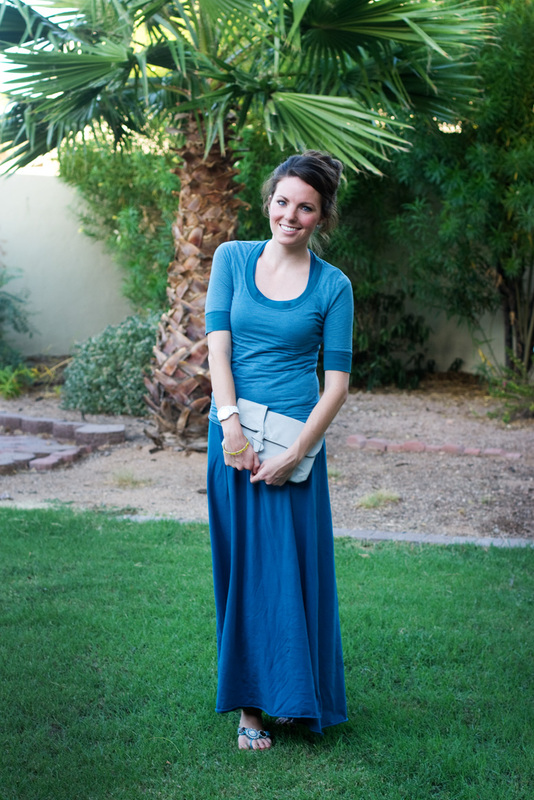 I've never worn the "monochromatic look" before, but I love it! Thanks for doing this challenge. When I was in the 10th grade I got to redecorate my room. I told my mother I wanted it to be like an ocean of blue. We painted the walls a beautiful rich dark blue and the carpet was the same and everything else in the room was pink and white. Thank goodness she talked me into the pink and white accents right!! I love your look today! How/where did you get that tree decal on the nursery wall?? Love the tree on the wall. Assuming you painted that? Its gorgeous. I love blues. So relaxing and tranquil. You look great and comfy! I also love the nursery wall! SO cool! That blue looks so pretty on you! The clutch is a great accessory and it's so sweet that it has special meaning to you. Love the blues! They look great on you and in your nursery. That tree is beautiful. I saw a woman at the grocery store today wearing a mostly green (with some white) skirt and a green shirt. I thought of your monochromatic challenge. An unknowing participant. I'm not participating myself because I'm pregnant and have about 4 shirts that actually fit. That and the fact that I'm a tired, tired, pregnant lady (I have a 2-year-old). However, I love the challenges. What a great idea. love this...I am your newest follower!